1. How to make a call? 2. Is there a possibility to find if the calling card has the Local Access Numbers? 3. What is the difference between making a call from the US landline or a cell phone? 4. What is the information to notice when I'm calling from a cell phone? 5. What happens if we call from a Payphone? In order to make a call, you need to call the Local Access Number or the Toll Free Number, and once you get the prompt signal, enter the Pin Number of the phone card and then make a call to the required number (which starts with "1" for the domestic calls and "011" for the international calls). Note: When you call from the registered phone, there is no need to enter the PIN number for the refilling phone cards. 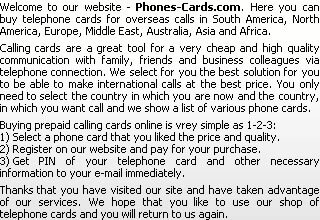 Check in the details of the phone card as well as in the online. The PIN number that you got has the complete instructions about the Access Numbers of the card. Also cross check with the service provider if the Local Access numbers would be charged as local or a long distance charge. Call the Toll free access number to find which your Local Access Number is. In United States, you can make use of any Local Access Number if your cell phone has a long distance plan. To know more about the features of your plan, contact your cell phone carrier. Making a call through the Payphone would land up in paying surcharges. For more details, check in the phone card. -	In your speed dial key #1, program your Access Number. -	In your speed dial key #2, program the PIN Number. -	In your speed dial key #3, program the destination number of your call. -	First dial the speed key #1 and then you will receive a signal to enter the PIN number, and dial the speed key #2 and again you will get a prompt and then enter the destination number and finally dial the speed key #3.